Visit our ONLINE calendar for our complete and current listings! One Big Roof is at 538 Maple Ave! One Big Roof, Center for Mindful Practices, is located at 538 Maple Avenue (Route 9), Saratoga Health & Wellness Building (across from the Maple Avenue Middle School, just off Route 50). Enter at the rear of the building. 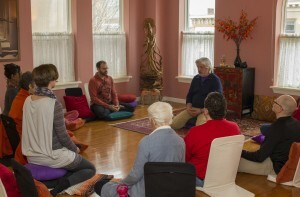 We offer plenty of space for our continuing meditation, therapeutic yoga, and Saratoga Stress Reduction classes, signature programs of One Big Roof. Parking and access are a breeze! We celebrate good synergy with Saratoga Health & Wellness as we provide one another with complementary holistic modalities. Join us at our Maple Ave location as we serve the community in mindful practices that include body, mind and spirit. Note: All services with our individual practitioners are at One Roof, 58 Henry Street. Find out when our upcoming Wellness & Healing Workshops are scheduled. Contact Director Pierre Zimmerman to inquire about the space at One Big Roof.